During the manufacturing process of precision side-cutting pliers, we focus upon over 50 critical production processes. We are the largest manufacturer of pliers in Japan, which is a factor ensuring the high quality and reliability of our pliers. We have been, manufacturing pliers for over 70 years and have developed the latest technology production facilities. 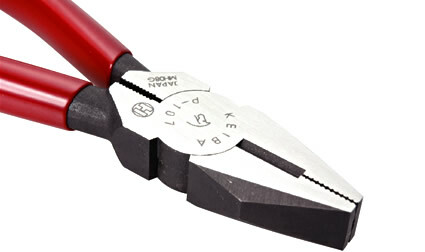 As a consequence, all Keiba pliers are produced by fully experienced craftsmen using modern equipment. Keiba enjoys an excellent reputation and is known as the leader in its field in the domestic and overseas markets. Keiba has established its own quality standards within its plant, which are to a higher standard than the Japanese industrial Standard (JIS). Keiba side cutting pliers provide the perfect cutting feel when cutting from 0.3mm fine metal wire up to heavy-duty hardened steel wire.